We had such a lovely June and we were very creative! We made lavender owl sachets, which we'll be repeating on July 10th. 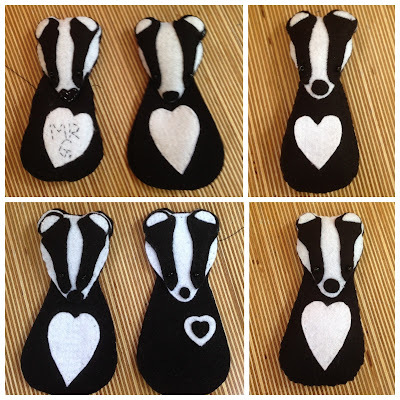 We also made, by popular request, felt badgers to match our felt foxes. I wanted some VERY long shelves for my living room wall and a VERY long radiator cover for my VERY long radiator, so I overcome my fear of drilling holes into my wall and this is what I made. You have no idea how hard it is to get long pieces of timber, so I used decking! I customised three old radiator covers, which were all different sizes, by taking them apart, cutting them to size and putting them back together again to make one long....very long....radiator cover. Then I painted it all white. The grooves are perfect for stopping my art work from slipping off the shelves.